Network analysis, using vector based data layers, can be useful to determine precise routing directions on a given road network. Here, we will determine best routes between destinations using raster datasets that determine cost based on cumulatively calculated cell values. 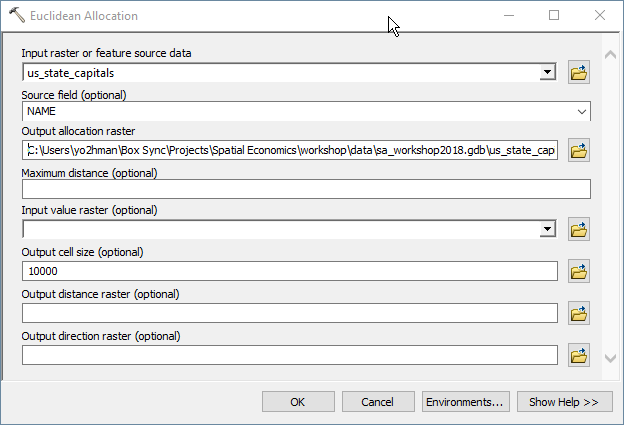 We will use ESRI’s Spatial Analyst tools to perform least cost path analysis. Through the process of this workshop, you will be creating many new data layers. 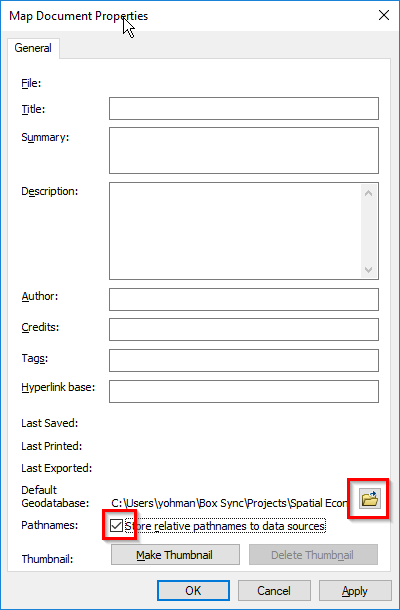 It is always good practice to designate a path to the geodatabase that you will use to store the layers. 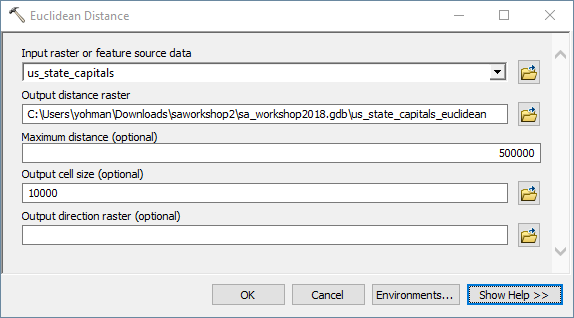 Change the default geodatabase by finding the path to the workshop geodatabase you just downloaded. Are we using feet? Inches? Miles? Or are we more non-American and using meters and kilometers? Your cell sizes and measurements in spatial analysis are dictated by what you chose as the coordinate system for your project. 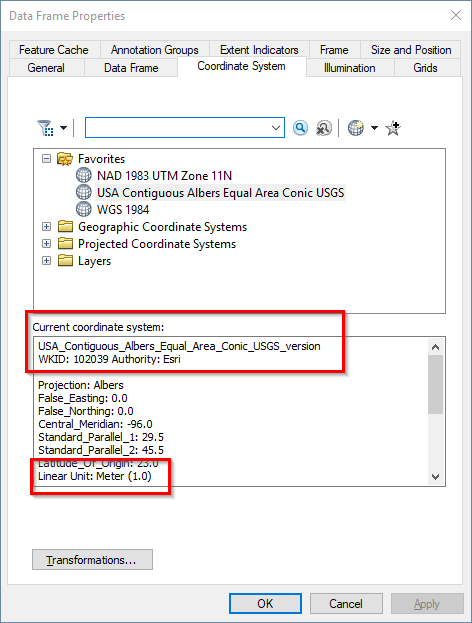 The layers in this workshop’s geodatabase have all been projected to USA Contiguous Albers Equal Area Conic USGS, which has a linear unit of Meters. How clustered are our state capitals? Which areas of our country are not even remotely close to a state capital? We can visually depict distances from any location in the country to their closest state capital by creating raster layers with cell data with distance measure. What does the map tell us? Examine the map and explain what you are able to observe. What do the colors represent? 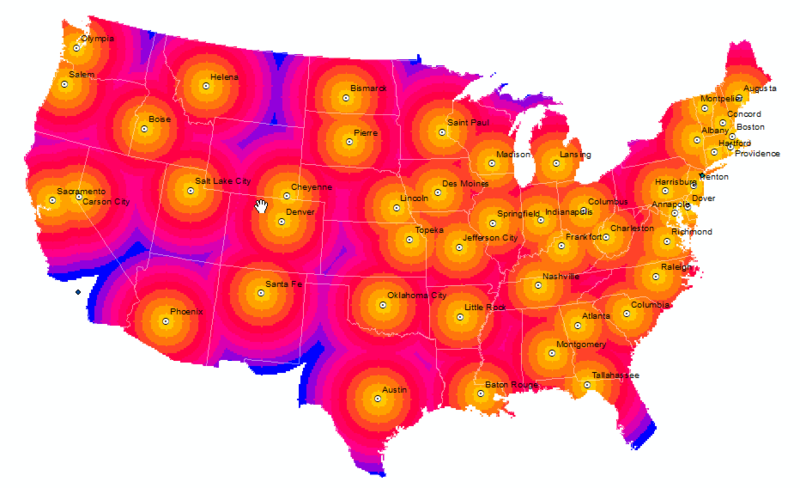 What does that tell us about the spatial distribution of our state capitals? Which city is not within 500km of a state capital? 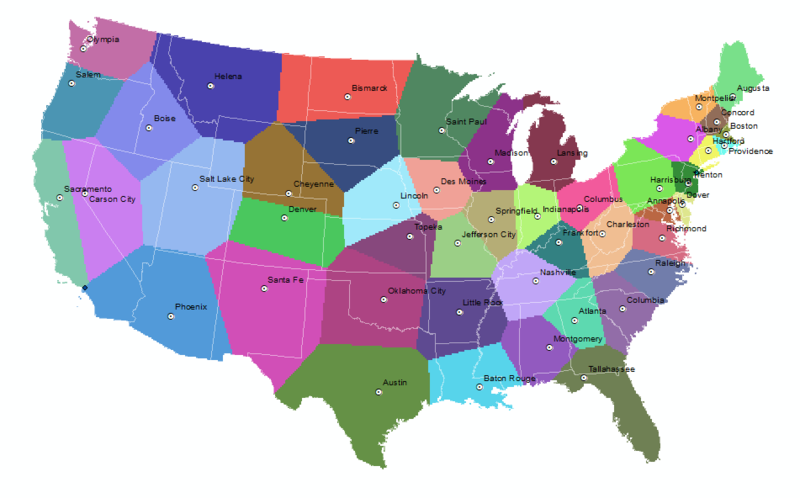 Now, what if we were to redraw our state boundaries? And what if we were asked to do so in away that every single location in the country was allocated to its closest state capital? Examine the map and explain what you are able to observe. What do the colors represent? What state would Los Angeles be in? 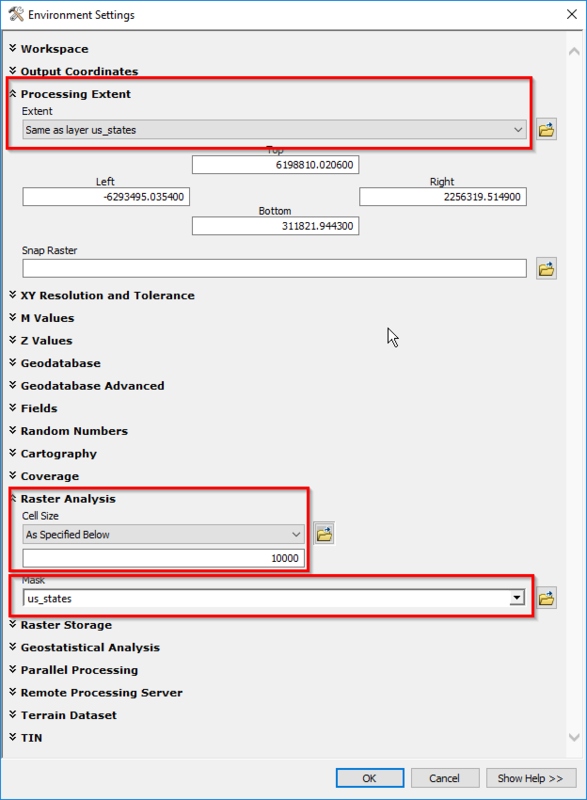 First, convert the layers that we will use for our cost analysis into rasters. For this workshop, we will convert our roads and railways. 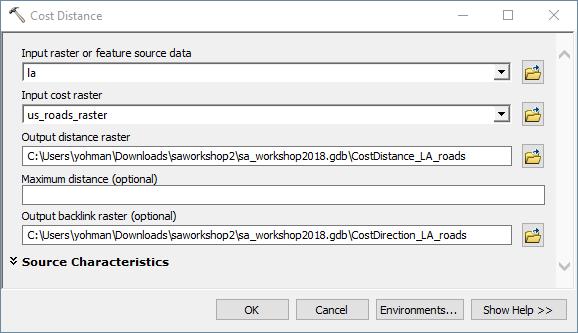 In order to calculate the accumulated cost distance from LA, we need to create two rasters: one for distance, and one for direction. 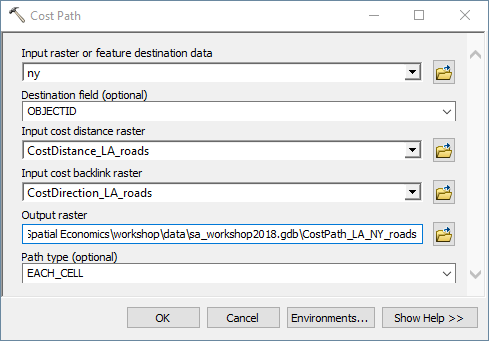 This will allow us to later calculate the least cost path from LA to any destination in the US. Finally, we are ready to calculate the least cost path between Los Angeles and New York. Which path has a higher cost? 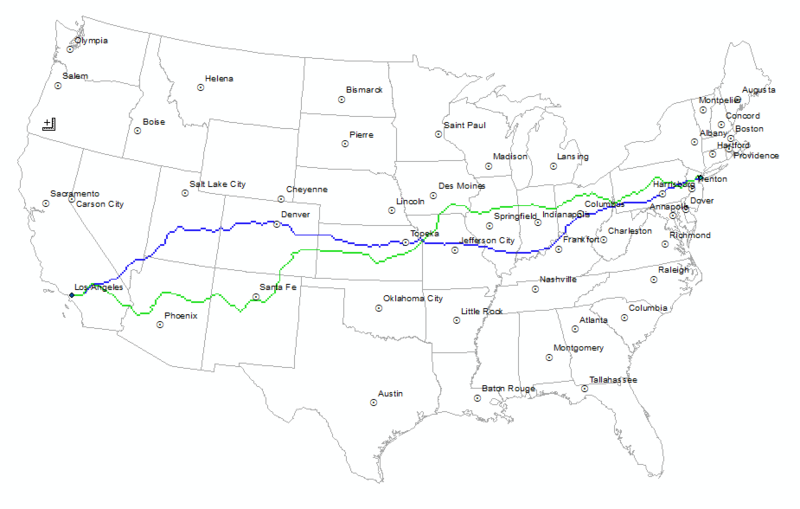 How many state capitals does each path travel through? Find out more about cost distance analysis here.